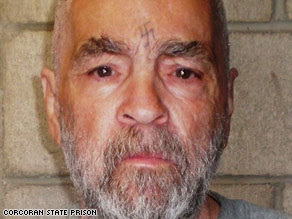 A new mugshot of Charles Manson has been released. Gone is the wild-eyed stare from his earliest pictures, replaced by the vacant eyes of an old, empty man. As much as his early mugshot creeps me out, I must say I'm bothered more by the recent one. He looks like a man without a soul... and perhaps he is. I pity Manson. Not because of the picture, but because of where I know he will spend eternity. I'm sure most feel that is where he deserves to be and perhaps he does. I'm not God. But at one point, he was a child and I just can't believe he was always evil. Who knows what pushed him into the life he chose. Lots of people have childhoods as traumatic or even more so than his, and they don't all become homicidal maniacs with a cult following. As horrific as the Tate-LaBianca murders were (and the quasi-circus aftermath of the trial), I'm not quite sure why Manson is so notorious. Now don't get me wrong. I think he totally deserves to rot in jail for what he did and I am in NO WAY defending him. I'm just trying to figure out how he someone became our country's embodiment of evil. To my knowledge, he was never actually convicted of personally killing anyone. Maybe it's because he so easily influenced and controlled people that sealed his legal fate. I'm not sure who would scare me more: a killer or someone who can have me killed and convince the murderer to take the fall for him. The power he exerted over his followers is unsettling at the least. But he's not the most brutal killer in our country's history. There are serial killers with a much higher body count and those who not only murdered but dismembered or even ate their victims. There are also people who are just as dangerous as he was as far as influencing people to commit acts of violence. Last night I was watching a documentary on white supremacists and neo-Nazis in America. Some of the things these people discuss--on radio, the Internet, in print--is no less crazy or hate-filled or dangerous as Manson's "philosophy." Manson believed a race war was imminent and that the blacks would rise up against the whites and kill them all. He believed he and his followers would survive and would rise up to rule the country since the blacks would not know how (on a side note, Manson believed he and the Beatles would constitute the 5 Jesuses... nuts). This may all sound like insanity, but some of it is not much different that the propaganda spread by today's white supremacists. People like former KKK-member Tom Metzger are just as much of a threat as Manson was. Metzger encourages "lone wolf" supremacists to assimilate into society and even pretend not to be racist so that they don't draw attention to themselves. Specific guidelines for these individuals or small cells include, "Act alone and leave no evidence; do not commit robbery to obtain operating funds; act silently and anonymously; do not deface your body with identifiable tattoos; understand that you are expendable; and whatever happens, do not grovel. If our race is going to die, at least let us die with dignity!" 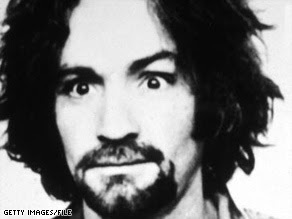 Manson and his followers have been denied parole continually over the years, as they should have been; however, others who have committed crimes as bad or even worse than theirs have walked free. What exactly pushed the Manson "family" onto a different level? Why aren't other criminals also denied parole? Are the feelings of the Tate family somehow more important because she was famous? And why are so many people walking free who have undoubtedly incited acts of hate and violence with their own words? Seriously, watch some of the docs on History and National Geographic about the white "power" movement in our country. It will scare the hell out of you. Okay, rambled enough. Gonna go find something happy to read about now. Women like this are rare, especially in our society today. A woman who is noble, who is of high morals and character, is priceless. Men may be attracted to outwardly beautiful women, but life will be long and difficult if there is no inward beauty. Whether you’re a wife or not, these are all attributes we should strive to have in our lives. A noble woman is trustworthy. She will conduct herself in the same way, regardless of whether or not she has an audience. She can be trusted to make wise decisions, to be honest, to keep secrets. In a marriage, her husband knows he does not have to keep tabs on her whereabouts, her spending or her friendships. He can rely on her in both the good times and bad times and can be confident that she will strive to make the best decisions for their household. A noble woman wishes to see those she loves healthy and happy. She will avoid actions that could harm the people she cares about. A noble wife upholds her family name. She does not do things that could hurt her or her husband’s reputation. She does not want to be an embarrassment. A noble woman and wife does not talk unfavorably about her loved ones. She doesn’t want to lower others’ opinions of her family. She brings respect and dignity to her family. A noble woman works hard and works smart. Though women today don’t have to “select wool and flax” and make their own clothes, a noble woman shops smart She shows good judgment in her purchases. A noble wife does not waste her resources. She shops for bargains on clothes, food and household items. She is not wasteful. And while we don’t have to necessarily “get up while it’s still dark,” a noble woman is not lazy. She fulfills her household responsibilities to her best ability. The “noble wife” prepares (or acquires) food for her family and keeps her family healthy. Being a woman—especially if you’re a wife/mother—is a full-time job. It doesn’t often seem fair that we work all day and into the night, but God has equipped us to do this. Though men may be physically stronger, women seem to be able to handle burdens more adequately, especially the burdens of her family. A noble woman is generous and compassionate. She doesn’t just give money; she gives of herself. S he gives her time and her heart. For women with children, this is a beautiful example to pass on. Children learn from their parents’ actions; demonstrate charity and kindness. A noble woman plans ahead. She doesn’t focus on what she wants to do, but what she needs to do. She plans for the future, not just tomorrow. Her family is ready for almost any situation. She makes sure that they are prepared for even the hardest times. A noble woman takes pride in her appearance. This doesn’t mean she’s vain or that she spends all of her money on clothes, hair and jewelry. Even if her clothes are not of the finest quality, she will make sure they are clean and presentable. She will take care of her body and appearance. She will also take care of her home and take pride in her surroundings. She will make it a place of rest and comfort for herself and her family. A noble woman brings respect to her husband. People are influenced and often based on the company they keep. A man with a noble wife (as opposed to just a pretty wife or even a smart wife) displays wisdom in his choice. A noble woman uses her talents, whether she receives monetary compensation or glory in heaven later on. Whether it’s working with your hands or working in the church, each noble woman has her own God-given talent. A noble woman may feel weak, but her spirit is strong. She does not bring shame or disgrace on herself or her family. She is a role model for her children and for other women. A noble woman has joy. She may be stressed and frustrated, but she does not let worry overtake her life. She dwells in her joy and blessings and strives to find happiness in every situation. Noble women are often sought out for their advice. They do not speak from sheer emotion but from wisdom. They keep the best interests of others in mind and do not offer advice based on personal gain or desires. A noble woman accepts that she cannot be lazy. She may not get everything done on time, but it won’t be due to idleness. She is actively and healthily involved in the lives of her family. but you surpass them all." A noble woman is appreciated. Her joy and morals will rub off on those around her. Noble women might not always receive the praise they deserve, but their family and friends do notice their hard work. Noble women are sometimes taken advantage of but are always loved. They are a blessing to everyone who meets them. The family of a noble woman sees THEIR mother/wife as the best, even if they’re too proud or embarrassed to admit it. A noble woman will be rewarded. Perhaps she will not receive her reward in this life, but she will in the next. And whether she realizes it or not, her good attitude and good works are an influence of everyone she encounters. As women, we are often overwhelmed on a daily basis. It’s easy to read Proverbs 31 and think, “There’s no way I can do or be all of that!” Just as God doesn’t expect us to be perfect, we aren’t expected to be perfect wives, mothers, or women. This should be a list of characteristics for us to work toward, though. Honor God with your life; seek His help in both your best and worst times. It is only with Him that any of this can be accomplished.